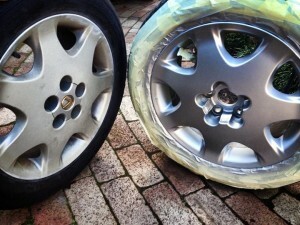 Smart Finish repairs – making these old Lexus wheels look new again. We get calls every day from all kinds of people explaining the events that caused their wheel damage. Whether your wheel damage is courtesy of your spouse (who probably feels terrible right now), your kids (who are learning to drive in your car! ), a random stranger (bastards) or phantom kerb (f$%k) – we know all about it. maybe you spent years longing for the ‘perfect rims’ and now you finally have them, so you want them to be perfect! Whatever your reason, don’t be embarrassed to give us a call. We’ve heard it all! When you book our wheel and rim repair service, there are a few options. The most common scenario is that we come to your location and fix the wheel there and then. This is a convenient, same-day wheel repair service that clients love! A second option is that we can take your wheels away, repair them at our workshop and return them to you later. This pick-up/drop-off service is also super-convenient for our clients, as long as you don’t need to drive your car for a day or two. In any case, there is a significant amount of work required in fixing a wheel. The steps include rebuilding/smoothing out the damage, repainting and refinishing. It takes as much artistic skill as it does technical skill; much of our time is spent making the wheel look perfect. The entire refurbishment process can take anywhere from 1.5 to 3 hours each wheel, depending on the extent of the damage. Even if you only have damage to one of your wheels, we can still come to your location and repair the one wheel. And it doesn’t matter if the entire rim needs repairing or it’s just one part of the rim. In other words, no matter what the situation, we can help you out. Very rarely the damage can be so bad that we won’t be able to repair it. In this case, we’ll refer you to a heavy-duty wheel repair shop. While you’ll end up paying more for that kind of service, it’s money well spent, especially to have bring your car back to showroom presentation. We’re proud to operate in partnership with a few alloy wheel repair shops and mobile businesses in Perth Northern and Southern regions. We find there is so much work that we don’t really need to be in strong competition. We all help each other out. As our customer, that’s great news for you because you can rest assured you’ll get the right person for the job and won’t pay more than you need to. If you have a wheel that needs repairing, please give us a call. Better yet, send us an SMS or email with a photo of the damaged rim and we’ll give you a fast quote!